I know, I know: a pig skull is not a vertebra, and it’s not from a sauropod. On the other hand, it is a cool zoological object, and every home should have one. I’m going to show you, in glorious technicolour, how I made a pig skull in under 24 hours at a cost of £3 and some silver, using only implements I had lying around. About the chopstick: you want it to have a fairly pointed end so that you can go poking it in cracks and crevices, so a Chinese-style broad-tipped chopstick won’t do at all. If you don’t have a Japanese-style chopstick, simply visit a sushi restaurant and take the sticks home with you at the end of the meal. Got your tools? OK, off we go! In case it’s not completely clear, that is the head slightly to right of centre — you can see its teeth if you look carefully. To the left is the huge pile of fat that I’d sliced off the head. I could not believe what fat heads pigs have. The amount of actual meat is tiny in comparison: you can see it over on the right. Most of this was little fragments, with the only two half-decent chunks being from the cheeks. I guess they were about two ounces of meat each (50 g), based on the similarity in size to a vanilla McDonalds hamburger. At this point, I threw away the fat, put the head in the pan, filled the pan with freshly boiled water until it covered the head, added some washing-up liquid (“dish soap” for you Americans) and left it to simmer for two hours. While that was happening, I fried the meat from Stage 1 and ate it as part of my lunch. Danny (my eldest son) had some; the other two didn’t fancy it. Notice the big pile of meat to the right — that’s what came off at this stage. By now the shape of the skull is apparent, but there is still plenty of soft-tissue left. In particular, the big jaw muscles inside the zygomatic arches were impossible to get out at this stage, thanks to a combination of strength and slipperiness. At this stage, the lower jaw could, just, be moved, whereas before it was solid with rigor mortis. If I were making a movie about zombie pigs, this is the stage I’d film them at. I took this photo before removing the eyeballs (this is where you need the teaspoon). Turns out that eyeballs are a lot tougher than I’d realised; so are the optic nerves. At this point I didn’t know how many boilings would be needed, but it turns out that the next one was the last. Into the pot it went again, with fresh hot water and washing-up liquid, for another two-hour simmer. When it came out, I drained and cooled it as before, and picked off as much of the remaining flesh as I could. Now the jaw muscles came away easily, and I was able to pull out the cartilage plug in the nose. Again, there was a surprising amount of meat from this stage, but the skull was basically free of its fleshy encumbrance by this point. I rather wish now that I’d kept the fat from stage 1 and the meat from stages 2 and 3 so I could have piled it all up together and photographed it together with the skull. By now, the mandible was cleanly separated from the cranium, and it was easy to rub away the remains of the cartilage covering the joint. By now, only small and tough bits of meat remained. Plenty of them could be scraped away using the Japanese chopstick: this was particularly useful for digging around in between the teeth. By far the hardest part of the cleaning, though, was getting rid of the brain and the cranial nerves. The problem is of course that you don’t want to crack the braincase open, and the brain is far too big to come out of the foramen magnum. Apparently the only way to do this is to swirl your chopstick around inside the braincase, then try to scrape the brain out bit by bit. This I did using several methods: I poked the cranial nerves back inside the braincase with my trusty sushi stick, smushed everything up, tried to hook bits out, ran water through the skull from nose to braincase and generally shook that baby around, getting little bits of brain out. This took a while and was, truthfully, not the most delightful time of my life. 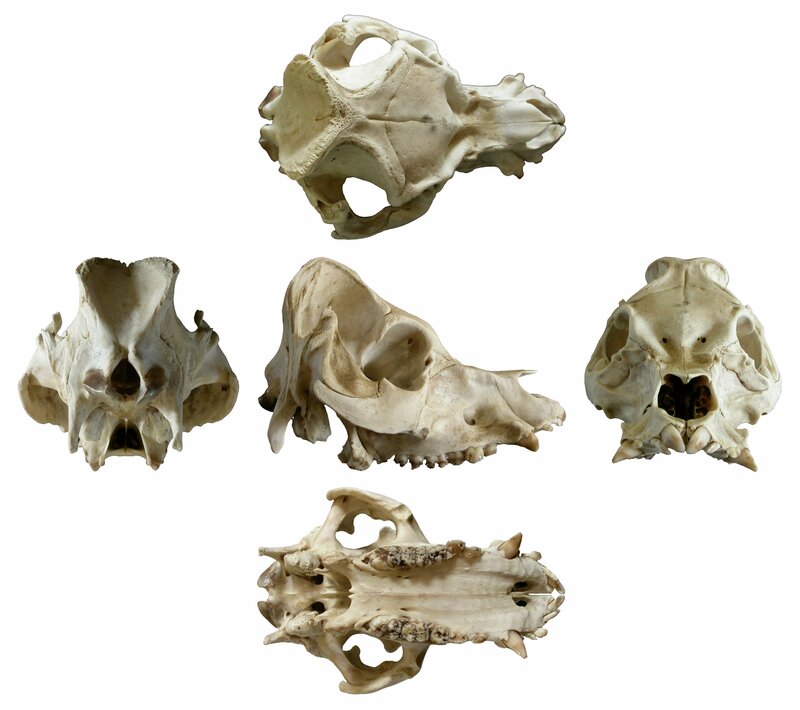 Pig cranium in dorsal view (top row); posterior, right lateral and anterior views (middle row); and ventral (bottom row). This image, together with a version on a grey background, is also available over on my website, next door to the turkey cervical. 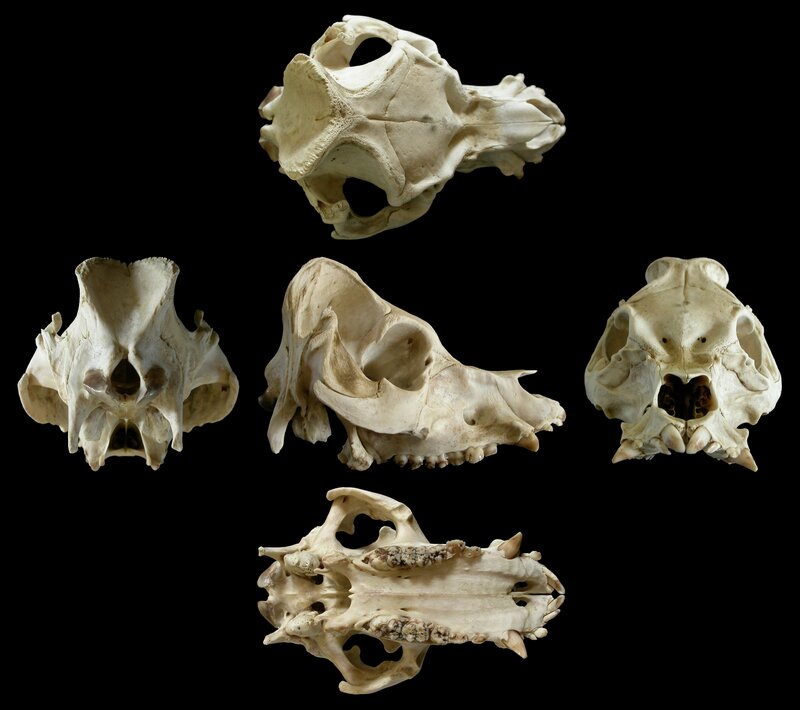 Folks, a pig skull is a serious piece of kit. What I have here is the foundations of my very own museum of comparative osteology. Everyone ought to make one. There are a few bits and pieces of meat that I couldn’t get at, either because they were too firmly attached, tucked away in narrow crevices, or inside the braincase where I couldn’t see what I was doing. So it’s time to let invertebrates do their bit. The skull is currently out in the garden, under a bucket weighed down with bricks so a fox doesn’t wander off with it. Hopefully in a few weeks, insects will have dealt with the remaining soft-tissue. Then I can re-bleach the skull in dilute hydrogen peroxide to deal with the likely discoloration, and glue the loose teeth into the defleshed sockets, and then I really am done. 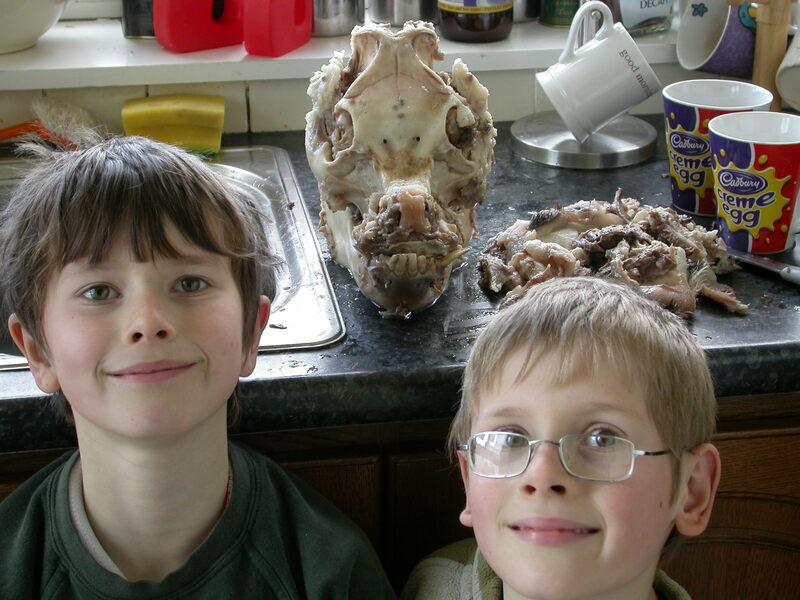 I leave you with a photograph of my two eldest sons, Matthew (9) and Daniel (10), with the partly prepared specimen. Left to right: Matthew, Piggy the Piggy from Piggyland, Daniel. 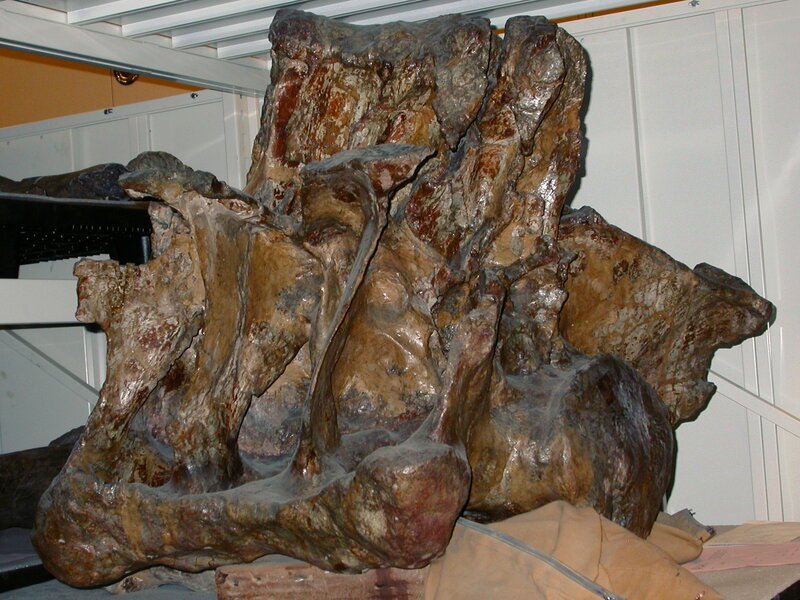 Sacrum of Camarasaurus supremus, AMNH 5761, in left posterolateral view. Really wonderful walkthrough, Mike. 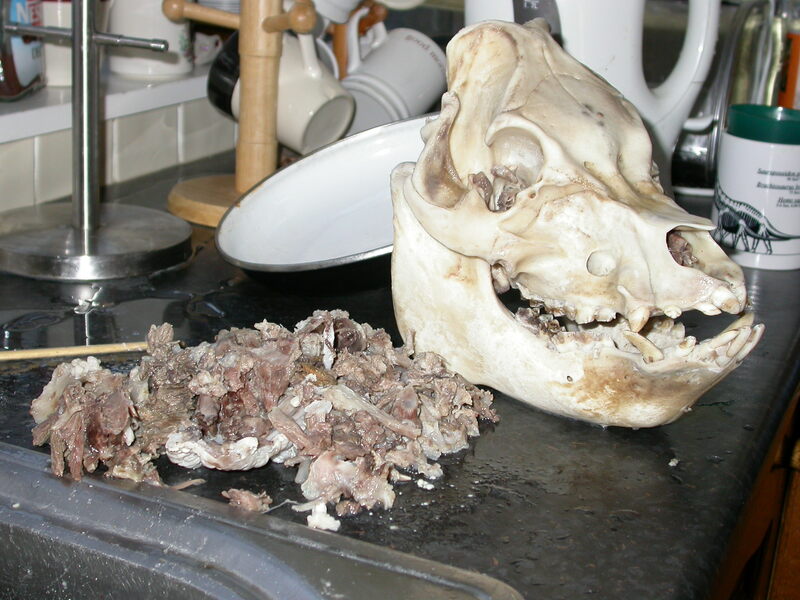 I had the pleasure of cleaning my own pig skull about eight years ago, through a process very similar to yours. 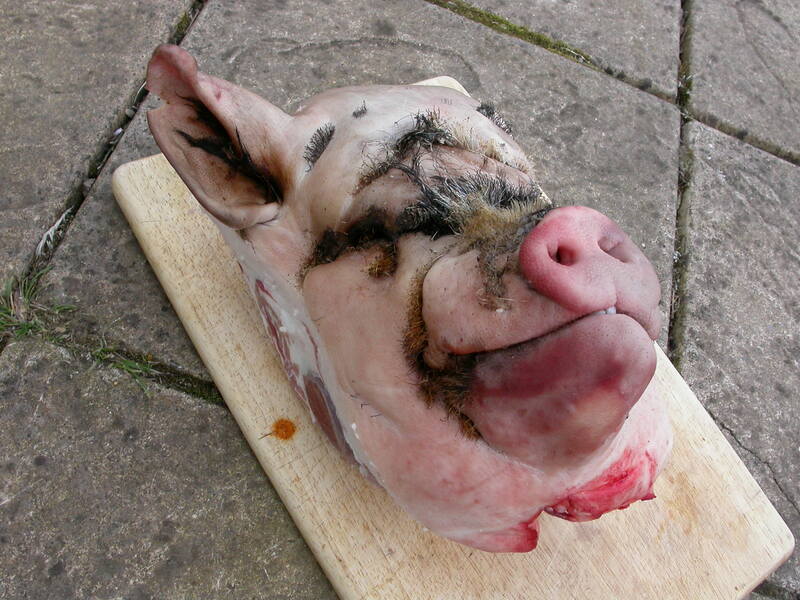 I got my pig head from the head chef in a cooking class–he knew I liked bones, so he gave me the head and a quizzical look. I did a lot more picking apart than you did, as only one boiling was in the cards for me (the stench prohibited a second round). I got the brains and sinus tissue out with a water pik, which was ridiculously enjoyable. The skull turned out very nicely, though unfortunately nobody knows where it ended up. Probably in my parent’s backyard, chewed to pieces by their dog. However, since then, I’ve had the pleasure of using the same processes on a black-tailed deer (with antlers!) and a timber wolf. The timber wolf came out beautifully. The deer too, but I’m very proud of that wolf. Unfortunately, after about five years of drying, the teeth are starting to fall out, and the mandibular symphesis has diappeared, requiring the use of a rubber band to keep the jaw together. Someday I’ll take super glu to the tooth sockets and the symphesis, but I keep forgetting about it. The Egyptians cleared out brains by pulping them with hooks they rolled between their hands, inserted up the nostrils. The ends of the hooks were bent fully over, like a “u”. As you may have seen from my blog, I’m steadily working my way through prepping the skulls from a bucket of 40 odd lizards. Pigs seem insanely easy because 1, they don’t have osteoderms and 2, they have decent 1 piece skulls that don’t fall apart when boiled. I swear I blunted every dissection tool I owned trying to get through the skin of Gerrhosaurus (plated lizard)- those suckers are tough ! Adam, my youngest leopard gecko is getting ready to croak (despite my best efforts). Leopards don’t have osteoderms, but I don’t want his bones to fall apart in the boiling water. Any tips? I used to boil pig heads for food, guess I missed out on some impressive wall decoration. 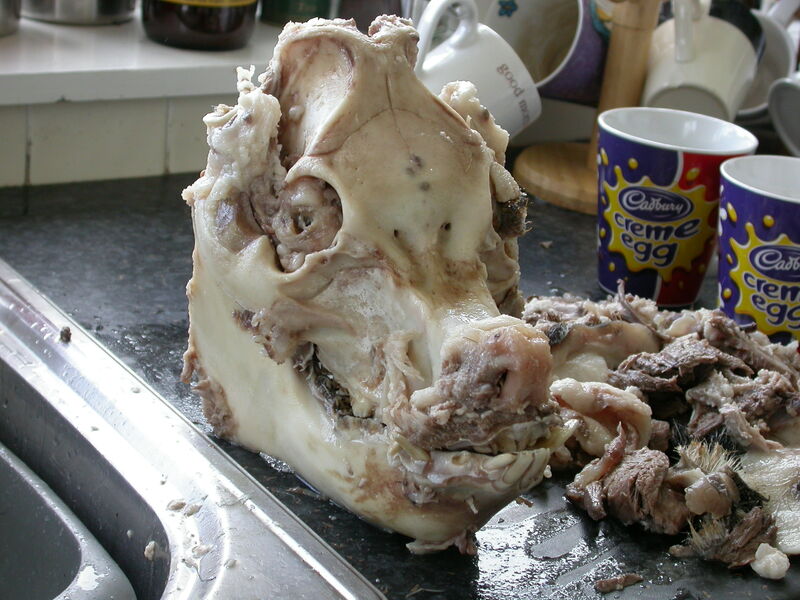 Pig Head Picture of the Week coming soon! The idea is simple, the practice a little tricky. First skin the head and try to remove as much muscle as you can without cutting through any bones (you’ll need to have some idea of what to expect the skull to look like). Fine pointed surgical scissors and a thin pointed scalpel blade are good for this job. Fortunately Geckos have lost the postorbital bar so most of the temporal region is just space making it a little easier to cut away the jaw muscles. Then give the skull a quick soak in ordinary household bleach (for a leopard gecko I would say about a minute and a half). Rinse off the bleach and allow to dry. Before it gets crispy dry the muscles will start to shrink and the bleach will have weakened their attachemnt tot he bones. These can now be picked off with a pair of jewelers forceps. The eyeballs can be pulled out backwards therough the large temporal space. Sepparating the lower jaw is tricky sine the transverse flanges of the pterygoid descend ventrally alongside the medial side of the mandible making it difficult to cut the tissue between them. Basically I’ve found that once you have removed much of the jaw muscle you can gently apply pressure at the font of the jaws to open the mouth a little (this may well be easier in a fresh specimen rather than the aged preserved specimens I’m using)and then cut into the corners of the mouth (don’t hit the coronoid process on the mandible)until it pops open completely. Stripping the palate skin is also tricky as the loosely attached pterygoids can come away if you are too heavy handed. A mounted needle is good for getting between bone and tightly adherent skin and teasing them apart. You can also use the needle to mush the brain tissue by swirling it inside the braincase. The bit can then be rinsed out and a tap. You can give one or two more quick soaks in bleach (about 30 seconds) to help remove tougher connective tissue. Getting the ring of soft tissue that lines each nostril out is a real pain, though if you get the worst of it out the remaining bits shrivel up drammatically on final drying. Ahhh this blog is too wonderful! Thanks to this walkthrough I shall almost certainly have greater success after the next “Pig-Out” (what my brother calls his pig-roast party). Gee, guys, next time you do a post like that how about a “Spoiler Warning”. Spoiled my lunch this post did. You are seriously tempting me with this project — but I’m a bit taken aback by the way you casually tossed aside some prime calories there. Soppresatta, head cheese, jowls, snout, ears, lard — the face is the best part of the pig! Very nice, but I think I’d just let invertebrates do the job of removing most of the flesh so as to save myself from having to scoop out pig brain. Incidentally, I buried a nine-banded armadillo carcass in Maryland back in April and am returning there in a couple weeks to bring back the hopefully skeletonized remains. Can’t wait to see those xenarthrous vertebrae. Mighty Mickey messes with mammals?? Who knew?? Did you end up damaging the nasal turbinates while trying to clean out the brain? I can’t really tell from that final picture if they’re still there (I think I can kind of see them though), but from your description about running water through to nose it sounds like they may have been roughed up a bit. I try to be gentle with nasal sinuses when I clean skulls, but it’s not easy to preserve everything sometimes. It looks like you did a really great job though. Well, the skull certainly has SOME respiratory turbinates left, and they look reasonably complete to me; but I don’t have enough mammal-skull smarts to comment on that with any authority. The water running through didn’t seem to cause any problems, but then a pig’s skull is a pretty robust thing. Cleaning this up has certainly given me a new respect for pigs, and I am pretty keen on ensuring I never get bitten by one. My gecko is recovering! (I think) That’s good, but I admit to a smidgeon of disappointment associated with the loss of an awesome lizard skull. Great post, rad pictures! Can’t wait for Parts 1+n! Very fascinating, though distasteful. I am encouraged at the quickness of the process. Good training for budding young vertebratologists! I see Dr Steel discarded his own (smaller-scale) osteopreparatory opportunity. (Sequence from 2min00s to 2min42s). Great post! Pig skull are just cool. 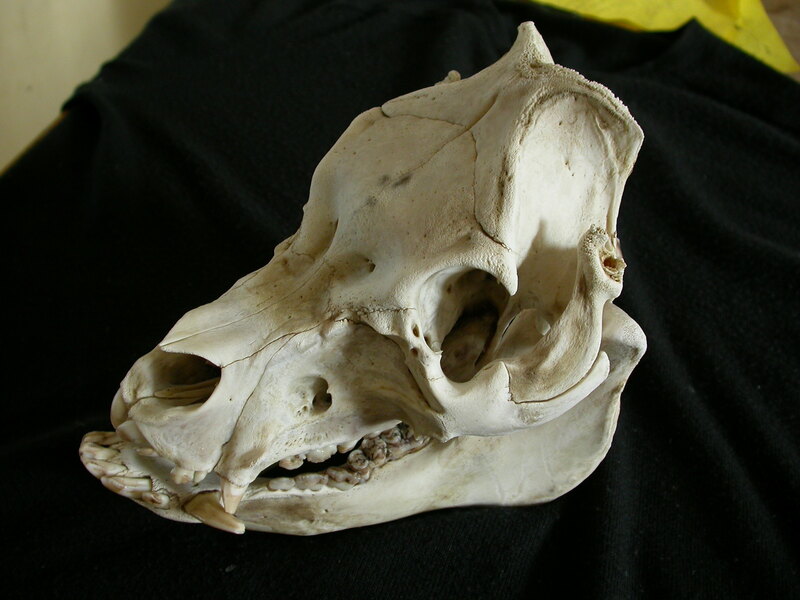 I played with the idea to clean a pig skull since a long time, but never did it. I think especially the skull of a really big breeding boar would look fantastic, but I suppose it is not that easy to get such a head. There are a lot of wild boars (Sus scrofa) where I live, and just yesterday I once again visited a small herd in big enclosure in the woods to feed them with old bread. They are really wonderfull animals, especially the big old boars, even if they are by far smaller than the big domestic pigs. To add also a note to Mikes second last comment, I suppose that skulls of crocodylians are probably even easier to deflesh, as they have very massive bones but only very little soft tissue around it. And crocodile skull looks really great, especially the really big ones. 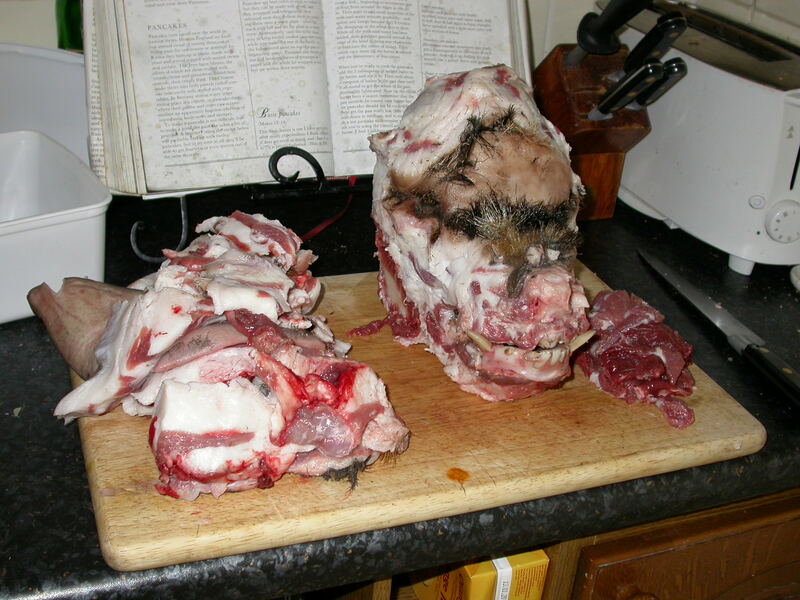 I have just finished a pigs head project too ! I acquired my head last spring and buried it in the garden covered with a bucket and weighed down by bricks. It has taken longer than my other skulls to clean this way but I’ve had no problesms with brains and eyeballs – all eaten ! I did had a very very nauseating expereince when i dug it up too early just bleaching it this afternoon when my husband found this page ! Hi, Linda. It’s good to know that burying can work well — I have badger that’s been decomposing underground for six months, and which I plan to exhume in a another six. No ideas about displaying, though: I do plan to try to mount my skeletons as in a museum, but I am going to have to figure out as I go along how that’s done. Hi, am about to boil 20 turkey heads that I’ve just been given by the butcher. Hurrah for Xmas! Any advice from the corpse boiling community?…. Well, what an awesome opportunity! Have just spent a VERY interesting hour on http://www.taxidermy.net and there is now practically nothing I don’t know about cleaning bird skulls. Cos I’ve got so many I’m going to do a series of experiments..
First the plain old boiling with Fairy Liquid as seems the easiest tho might over soften the delicate bones. Next I’m going to try cold water maceration, using the bacteria in saliva and a moderate constant temp. ( haven’t worked out how to do that without buying stuff, esp. in bleak midwinter) then acetone and bleach…de-greasing is of paramount importance, apparently. Also, might just try burying a few to see what happens. Mike ..I’ve heard of you via Sarah Bickers..didn’t think I’d come across you by googling..’boiling turkey heads’ tho! How funny that one of Sarah B.’s friends would land here by chance! I am delighted that you’re going to try all these different ways of prepping the turkey heads. You will have material for a fascinating sequence of blog posts if you choose. If you do that, please let us know, we’ll be delighted to link back to you. BTW., I don’t suppose I could interest you in popping one of your heads in the post to Ruardean, could I? Most certainly but will need advice.. should i freeze it, seal it in tupperwear or just stick it in an envelope? I fully intend to document the process and would be honoured to post on yr blog. Won’t know the proper names for bits tho…but if the gilding comes off, can blind you all with the power of art! I’m new to the restoration of skulls and I find it to be quite an interesting process let alone observing the finished piece. I found a dead badger and am researching the best way to go about it. It’s freshly dead, no odor or bloating yet, although stiff. I have 3 other skulls one I believe is a squirrel the other 2 are a small mutt the other a chow chow that had been mailed by coyotes. I managed cleaning these with ease for nature had taken care of all obut the smallest pieces of skin. An overnight soak in diluted peroxide fixed that. But anyway I’m not certain about the badger’s, being its so fresh. Any tips? Aside from what read on this page? Bill, great that you have a badger: they have awesome skulls. In fact, the whole skeleton is impressive, if you have the time, patience and stomach to clean it all up and keep it in order. (I buried mine in a plastic box a couple of years ago; I really need to dig it up.) But, no, I really don’t have any other tips beyond what’s already been said on this site. Feel free to ask an specific questions that come up, though. ah this is brilliant!! I’ve only ever been picking up skulls from the garden ect… Trying this as soon as i have some time off uni! For delicate bird skulls ect. does anyone know anywhere to buy nice display cases? what a weird/disturbing thing to teach small children! My experience: small children love skulls.